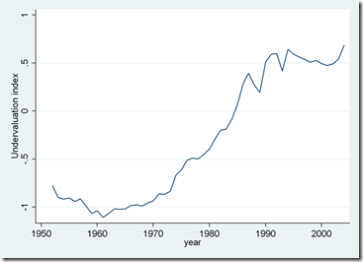 Does globalization erode social safety nets? Economic theory and intuition suggest that as economies become more globalized, the ability of governments to undertake redistributive policies and to engage in social spending erodes. After all, a large part of the tax base--corporations, financial intermediaries, and skilled workers in particular--become internationally mobile and can evade taxes needed to finance those public expenditures. This is important because historically countries that are more exposed to international trade have actually had larger public sectors, in part to insulate their citizens from shocks originating from abroad. This fact, along with the lack of an obvious decline in the overall tax take in major advanced economies, has led many observers to think that the hypothesized decline of the welfare state has not in fact taken place. Another interesting argument Bertola and Prete make is that private finance seems to have partly filled the whole left by public transfers. The claim is that more developed financial markets are able to supply the insurance and consumption-smoothing provided traditionally by the welfare state in very open economies. They use the share of house prices financed by mortgages as an indicator of financial development. I am sure this argument made a lot more sense a year ago, when the authors were doing their original research, than it does now. It will take a while until we think of finance, and housing finance in particular, as a source of insurance and stability. Financial markets are indeed in trouble and, if our perspective on past developments is correct, their fragility does not bode well for globalisation. The breakdown of private financial markets excites calls for stronger redistribution. If redistribution is national (as it has to be as long as politics are national), it will only be sustainable if national borders become less permeable to economic activity. Indeed. Welcome back to the political trilemma of the global economy. Our Center for International Development launched its new Empowerment Lab with a conference yesterday, and one of the most interesting new social entrepreneurship initiatives I learned about is something called MyC4.com. This is a web-based platform that allows you to look up a list of African entrepreneurs who need funding for their projects (described briefly on the site) and to offer them loans. You bid a certain interest rate, which is accepted as long as it is below the maximum the entrepreneur is willing to accept and as long as others have not bid below you. You can lend as little as 5 euros. The average interest rate accepted is 12.8 percent per year, and I am told that the rate of default has been so far in the low single digits. So here is a chance to make money while you contribute to Africa's development. Can too much competition be the culprit? In the United States, there were two key decisions. The first, in the 1970’s, deregulated commissions paid to stockbrokers. The second, in the 1990’s, removed the Glass-Steagall Act’s restrictions on mixing commercial and investment banking. In the days of fixed commissions, investment banks could make a comfortable living booking stock trades. Deregulation meant competition and thinner margins. Elimination of Glass-Steagall then allowed commercial banks to encroach on the investment banks’ other traditional preserves. In response, investment banks branched into new businesses like originating and distributing complex derivative securities. They borrowed money and put it to work to sustain their profitability. This gave rise to the first causes of the crisis: the originate-and-distribute model of securitization and the extensive use of leverage. Barry makes it clear that he thinks the deregulation of the 1970s and 1990s were sensible things at the time, and that they did reduce costs of intermediation. It was, he thinks, a case of unintended consequences. We are moving to a new world economy, and one of the casualties of the transition could well be the East Asian export-led growth model. My latest Project Syndicate piece evaluates the risks. There was a time when global elites could comfort themselves with the thought that opposition to the world trading regime consisted of violent anarchists, self-serving protectionists, trade unionists, and ignorant, if idealistic youth. Meanwhile, they regarded themselves as the true progressives, because they understood that safeguarding and advancing globalization was the best remedy against poverty and insecurity. So we have Paul Samuelson, the author of the post-war era's landmark economics textbook, reminding his fellow economists that China's gains in globalisation may well come at the expense of the US; Paul Krugman, today's foremost international trade theorist, arguing that trade with low-income countries is no longer too small to have an effect on inequality; Alan Blinder, a former US Federal Reserve vice-chairman, worrying that international outsourcing will cause unprecedented dislocations for the US labour force; Martin Wolf, the Financial Times columnist and one of the most articulate advocates of globalisation, writing of his disappointment with how financial globalisation has turned out; and Larry Summers, the US Treasury chief and the Clinton administration's "Mr Globalisation", musing about the dangers of a race to the bottom in national regulations and the need for international labour standards. The first three decades after 1945 were governed by the Bretton Woods consensus – a shallow multilateralism that permitted policy-makers to focus on domestic social and employment needs, while enabling global trade to recover and flourish. This regime was superseded in the 1980's and 1990's by an agenda of deeper liberalisation and economic integration. That model, we have learned, is unsustainable. If globalisation is to survive, it will need a new intellectual consensus to underpin it. The world economy desperately awaits its new Keynes. While, in principle, financial globalization should enhance international risk sharing, reduce macroeconomic volatility, and foster economic growth, in practice the empirical effects are less clear-cut. Risk sharing has increased somewhat in advanced countries—consistent with their greater levels of financial openness—but has not been noticeably affected in emerging market and developing countries. International financial integration has not increased macroeconomic volatility or crisis frequency in countries with well-developed domestic financial systems and a relatively high degree of institutional quality; it has, however, increased volatility for countries that have failed to meet these preconditions or thresholds. The link between financial globalization and economic growth is also complex. Although foreign direct investment and other non-debt creating flows are positively associated with long-run growth, the impact of debt seems to depend on the strength of a country’s policies and institutions. The paper’s empirical results are broadly supportive of the IMF’s “integrated” approach, which envisages a gradual and orderly sequencing of external financial liberalization and emphasizes the desirability of complementary reforms in the macroeconomic policy framework and the domestic financial system as essential components of a successful liberalization strategy. For countries that do not yet meet the relevant thresholds, the focus of policy makers should lie squarely with improving the relevant economic fundamentals. In addition, opening up to foreign direct investment (FDI)—a type of flow that appears to be beneficial even for countries with relatively weak fundamentals—would seem desirable at an early stage. Liberalization to other types of flow should be delayed until country fundamentals are more in line with the relevant thresholds. For countries that are closer to meeting the thresholds, opening to debt flows is unlikely to have strong adverse effects on volatility, though, equally, growth benefits have not been identified as being particularly significant in this case. This is a clear statement of the new conventional wisdom on financial globalization: reaping the benefits is by no means automatic, and you need to have the complementary institutions to make sure you do. This parallels a similar line on trade liberalization from across the street, which also takes the view that the gains are contingent on supporting institutions. What I think about all this is here. The governing party in Turkey has just been re-elected with a comfortable majority of seats in the parliament, ensuring that it will return to power single-handed. Markets breathe a sigh of relief and the Turkish LIra appreciates, reaching a record high against the U.S. dollar. Good news, or bad news? Obviously good news for financial markets, but what about the real economy? If, as I have argued before, a competitive currency is good for economic growth, what do we make of the exchange-rate appreciation? What has just happened in Turkey is a common occurrence in emerging markets. Once you open up to capital flows and adopt a floating exchange rate regime, financial markets determine the value of your currency. And the better you are at managing the economy, the more you get "rewarded" with an appreciating currency--except that you would have been far better off without the reward. It is a veritable Catch-22. There are exceptions of course. Argentina has deliberately avoided monetary policy orthodoxy, and its Central Bank is actively pursuing an undervalued currency (with the help of capital controls, price controls, and some fiscal restraint). China and some other Asian countries are intervening in currency markets to prevent appreciation and are accumulating huge reserves. But neither of these strategies is sustainable. 1. A large enough structural fiscal surplus to make room for looser monetary policy. A more competitive real exchange rate requires increased domestic saving relative to investment, and reduced national expenditures relative to income--and hence the need for a surplus. 2. A modified monetary policy framework, which gives explicit role to the value of the currency. The central bank will have to have a view as to what the appropriate range is for the exchange rate, and take action to move it there. This does not imply or require targeting a specific level of the real exchange rate, which would be much harder (if not impossible). 3. The use of tax and prudential instruments to reduce capital inflows and manage foreign-borrowing-led consumption booms (such as deposit requirements a la Chile or increased liquidity requirements on financial intermediaries). This is a tough menu. But let me know if you have better suggestions. UPDATE: The day after I wrote this, the TL was hit by the global market sell-off and took a nose dive. Such is the way of international finance. UPDATE2: Here is a longer version of the argument, written for Project Syndicate. Whenever John Taylor's name comes up, I can't help but think of his roasting by Princeton doctoral students sometime in 1983 or 1984 during the annual student skits. Taylor had recently moved from Columbia to Princeton, and was now being courted by Harvard and Stanford. And apparently he could not quite make up his mind. Or rather, he could too easily--only to change it a little while later. While we students were not privy to the specifics of the negotiations, we could follow Taylor's flip flops from the news bulletins the Department would stick in our mailboxes. "Taylor is going to Harvard," or "Taylor is staying," or "no, he is leaving" they would announce periodically. So the students in the skits had this great moment when they first paid tribute to Taylor and then invited Taylor, who was sitting at the back of the auditorium, to join them on stage to receive an award. Taylor got up and was making his way down, only to be interrupted halfway by the students, who went: "Nah, we changed our mind..." Sheepishly, Taylor had to turn around and go back to his seat. Taylor eventually did move to Stanford, and rose to new heights when he was appointed undersecretary for international affairs at the Treasury in 2001, shortly before 9/11. If he suffered from indecision in that position it is not in evidence in this interesting book, his first-person account of financial diplomacy in the post-9/11 world. The book focuses on his efforts at the Treasury to freeze assets of terrorists, restore financial stability in Iraq, finance the reconstruction of Afghanistan, deal with the Argentinean financial crash, and reform the IMF and the World Bank. One wishes that there was a little more economics in this book, and a bit less of a blow-by-blow account. But what I like about the book is the gentleness of spirit with which it is written. Taylor dutifully reports the occasionally harsh criticism he received--Joe Stiglitz once accused him of not being up to date with the relevant economic theory and practice on emerging markets--while avoiding the temptation to respond in kind, a rarity in books of this kind. In the past, finance experts have tried to insulate themselves from foreign policy. As George Shultz and Kenneth Dam put it in their book Economic Policy Behind the Headlines: "The Treasury and the Federal Reserve Board have always considered this field their special preserve and have seldom welcomed advice from other parts of the executive branch." To counteract this attitude, i began telling my Treasury staff to be on the lookout for ways that financial ideas could help our foreign policy, creating a different mind-set from that where they only worried that sound economic policy was threatened by foreign policy issues. increased financial openness improves risk sharing among industrial economies, but this effect is absent for the other two groups of countries. If anything, the authors detailed results suggest a decline in risk-sharing in developing countries during the recent period of financial globalization, despite a huge increase in gross financial flows. Why? The authors speculate that maybe it has to do with developing countries' reliance on forms of external finance which do not do a great job of providing insurance or with the boom-and-bust cycles that financial globalization has sometimes stimulated. One interpretation of our results is that there is a threshold effect in terms of how financial globalization improves risk sharing, in that only countries that are substantially integrated into global markets (in de facto terms) appear to attain these benefits. Note the caveat, "in de facto terms." In other words, there is a there there, and you get there when you get there. No, I am not referring to plans under way in the U.S. Congress to slap punitive tariffs on U.S exports. What I have in mind is a proposal that is suggested by the underlying economics of the situation, but which no-one has yet put forward. It entails granting China an exemption from WTO rules that prohibit subsidization of its export industries in return for a commitment by the Chinese government to let its currency appreciate. Crazy? Perhaps, but read on. First, let's agree that China's currency is part of the problem. 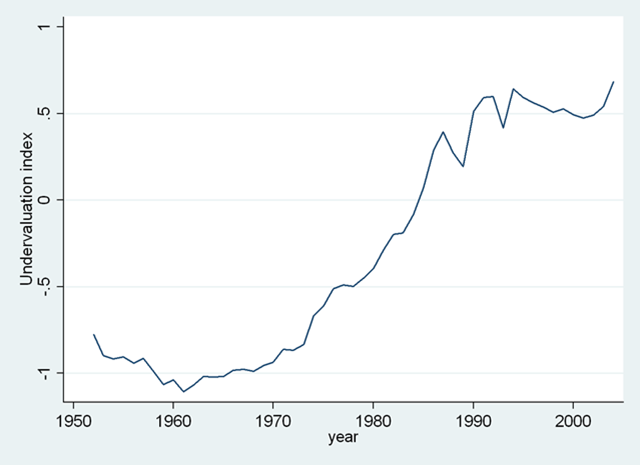 China's large external surplus (and its corresponding huge bilateral surplus vis-a-vis the U.S.) is driven partly by the undervaluation of the remninbi. Here is one estimate (from my ongoing work), which suggests an undervaluation of the remninbi of the order of 50% in real terms. The precise extent of the undervaluation is a matter of debate, and that particular question need not detain us here. Second, while Chinese currency policies may seem purely mercantilist, let's also understand that there are sound economic reasons behind it. Chinese economic growth for the last 10-15 years has been driven by a policy of encouraging tradable (and mainly export-oriented) industries. As these modern industries expand, they draw labor from significantly less productive rural and other economic activities, generating an increase in overall labor productivity and GDP per head. An undervalued currency is the linchpin of this growth strategy, as it provides the incentive needed by investors (foreign and domestic) to establish and expand exportable industries. Why would the incentives be inadequate without a hyper-cheap currency? Because market and institutional barriers prevent modern industries from getting started in poor countries without extra inducements. Using economics jargon, currency undervaluation is a second-best mechanism for overcoming market failures. The trouble is that an undervalued currency also taxes consumption of tradables at home, and this combination of subsidizing output and taxing consumption of traded industries results in a trade surplus for China and a trade deficit elsewhere. (The only exception are commodity exporters, who benefit from increased demand from China.) The U.S deficit is particularly worrisome, as it has spawned a backlash against China that is growing in importance and political salience. Let's not forget that macroeconomic imbalances have often been at the root of rising protectionism. Hence the current dilemma: Pushing China to revalue its currency is damaging to China's economic growth, and ultimately to its social and political stability. But doing nothing on the currency front risks dangerous unilateralism on the part of the U.S. But there is a way to de-couple China's trade balance from its need to encourage exportable industries, and that is to allow China to subsidize its industries directly, instead of through the exchange rate. In fact, China can provide any and all inducements it wants to its modern industries through fiscal instruments and still run a balanced trade account. A subsidy on tradables in conjunction with currency appreciation enables precisely that, as it generates more imports alongside more exports. Subsidies are of course costly to the budget, but China can easily afford them. In any case, it is not clear which is the more expensive strategy for China: outright subsidies or accumulating costly reserves to stem the appreciation of the currency? WTO rules currently do not allow countries to subsidize their industries when these subsidies have an effect on export levels. This prohibition has little economic logic behind it in any case. So exempting China (or any other country for that matter) from these rules will hardly do any damage. And it would have the big advantage of creating the policy space to overcome one of the most important policy challenges of our time. The quid pro quo would be this: you can subsidize your industries as much as you like; but you cannot let the currency stray too far from where it needs to be to generate (rough) external balance. This will allow China to pursue its highly-successful growth strategy without imposing large current account deficits on other countries.